Last evening I arrived in Israel with Leon Mauldin. We made our way from the Ben Gurion Airport at Lod in the Plain of Sharon up to Jerusalem in the mountains of Judah. There is always a bit of jet lag to deal with. I got a good night of sleep on the flight from Atlanta to Tel Aviv, but didn’t do so well the first night at the hotel. Nonetheless, after a late start and securing a data card for the air card we spent a good bit of time in the Shephelah (lowlands) of Israel (Deuteronomy 1:7). We have determined for this trip that we will concentrate on places we have not seen before, or where we think we need new photos for use in teaching. Our first major stop was 4.2 km west of Mata on Highway 375. I am not sure of the date of this unusual stretch of Roman Road, but I think most of the Roman roads date to the late first century or the second century A.D. 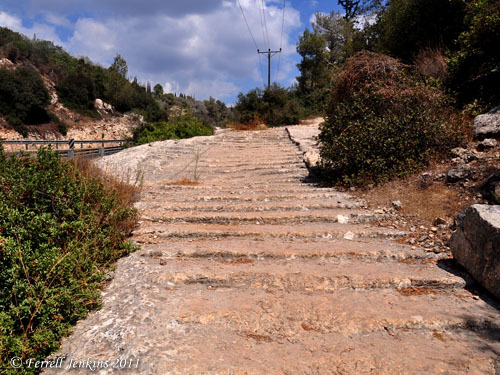 These steps would have made the trip up into the mountains of Judea easier for both man and beast. Roman Road 4.2 km W of Mata on Hwy 375. S of Hwy. Photo by Ferrell Jenkins. Incidentally, this road is only a short distance from the Valley of Elah. Later we photographed three significant archaeological mounds (tel or tell, depending on the languages), and saw several others. Tel Goded (Tell ej-Judeideh is thought my many to be Moresheth-Gath, the home of Micah the prophet (Micah 1:1, 14). Tel Burna is thought by the current excavators to be Libnah (2 Kings 19:8). Tel Zayit is thought by the current excavators to be Libnah. Yes, you read that correctly. More at a later time, perhaps. Most of our time was spent searching for the correct field road to get close enough to Tel Batash, the site of Timnah, for a photograph. We succeeded! We remember Timnah because Samson got into trouble with a woman of Philistia there (Judges 14). Be assured that this is fun as well as educational. Who knows what excitement awaits us tomorrow. Thank you for the terrific pictures!